To some people this is an opening line from a very funny comedy sketch show in late 80s/early 90s. To some people it is how they greet their children when they jump in the van after school. To some people it has become a fashion mantra they just can't help but live by now. Yeah, I'm all those some people. I'm in living color. And I'm linking up with the pleated poppy's What I Wore Wednesday(wiww) again to tell you all about it. I've had so much fun linking up with these fashion posts. They usually coincide with a sale at Old Navy and/or a major upheaval in my hormones or the seasons. This week it happens to be all of the above--Old Navy slashed their prices (jeans for $8! ), my hormones are f-ing nuts and it's a very cold, grey new year. BAM, time for a link up. When I first started posting about fashion I was on a quest for color. Tired of my normal all black wardrobe, I leapt out of my comfort zone with prints and bright colors. Some of my colorful looks from the past year. And, um, I need a new pose. After almost a year of color experimentation, I feel braver, bolder, funnier, zanier, weirder and just plain freer. Living in color is pretty damn awesome. So awesome that I can't stop. Even if all the fashion trends are saying "black and white are the new spring colors," I say a big "Whatever!" like I just threw up my hat, get it? At the recent Old Navy giveaway sale, I headed straight to the colorful pants table. This was one area (my bottom) where I had not yet dabbled in color. Excitedly I picked out red/orange pants. But the tag said "Super Skinny Jeans," not just skinny, "super skinny." Ugh. I didn't let it deter me, I sifted through the pile to find a pair that looked like they might fit over my, um, athletic calves. I sifted right on up and up and up, okay I was beginning to get deterred. Double ugh. "It's not you, it's the pants," a shy, yet shrewd, young salesgirl said to me. "You're right," I beamed and grabbed my three-sizes-bigger-than-any-of-my-other-pants jeans and headed to the dressing room. Repeating "It's not me, it's the pants. It's not me, it's the pants" over and over. The pants fit, which was great, I guess. No, it was great because they were only $8 and I have never had super skinny red/orange pants before. And I love them. I wore them that night paired with my new Old Navy polka dot cardigan. The next night I rocked a purple shirt with the orange/red super skinny jeans for a hot date with my husband. At first, I felt a little like a host for a children's show on PBS, but then I added some heels and got over it. My husband liked it and said that he wasn't worried about losing sight of me in a crowd. I took that as a compliment, who wants to get lost in a crowd? Sunday afternoon for my son's basketball game, the polka dot cardigan was back. I paired it with jeans and a favorite bright yellow necklace. Here's my interpretation of sloppy/preppy tired mom who can't stay up late on a hot date and look super together the next day look. Polka dots have not been in my closet since 1988. Wearing polka dots is funny to me now because they make me think preppy and I am so far from preppy. Irony=funny to me. So how are you living? 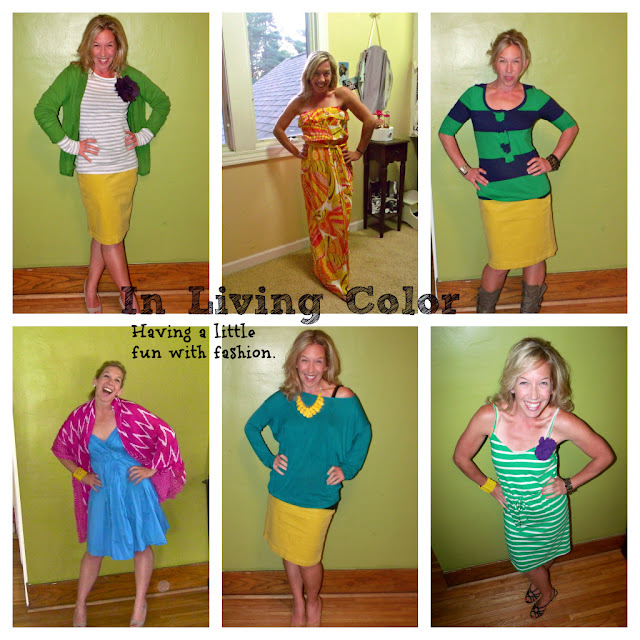 Are you in living color? No? You should try it, don't be afraid. It's fashion, it's fun and if it doesn't work out you can always say "it's the pants, not me" and it's all good. Hope you are having fun with your fashion. You can also find me on Twitter @AngelaYBlood and Instagram@JumpingWithMyFingersCrossed and here on Pinterest too. And just in case you need to sing along, here is the In Living Color intro featuring the late great Heavy D.
Yay for color. Loved all your outfits. I'll be following to see what you're up to next. You're so stinking adorable. I love color, so much, but I haven't crossed the line into colored pants yet. I should! I love that yellow skirt! Where is it from? And I wouldn't normally put red and purple together, but I love it on you! roots. Leeson said she decided to transform herself into a Kim clone after being bullied and called "ugly" all her life.